August 30, 2012, Woodstock, IL - Newer Technology, Inc. (NewerTech®) http://www.newertech.com, a leading developer of PC, Macintosh®, iPod®, iPhone®, and iPad® performance upgrades and accessories, today announced the NuGuard® Universal Tablet Rack, a Plug and Play 'BYOD' (Bring Your Own Device) storage and charging solution for technologically savvy classroom, office, retail, health care, and other multiple brand tablet computer user environments. Designed to accommodate nearly any tablet PC including Apple iPad, Samsung Galaxy, Google Nexus, and Asus Transformer models, the NuGuard Rack allows tablets even in thick, protective cases to slide easily into one of eight bays to store and charge. By providing ample room for popular cases like the Apple Smart Case®, as well as impact-resistant "armored" cases like the Gumdrop Drop Tech and Griffin Survivor, the NuGuard Rack can hold tablet PCs up to 10" D x 8" W x 1.5" H in size. The NuGuard Universal Tablet Rack's small footprint makes it easy to set up on a desktop, shelving unit or any other horizontal surface. Constructed from 100 percent recycled plastic, the unit is highly durable while non-skid rubber feet make sure it stays put. For added stability, pre-drilled anchor points enable the NuGuard Rack to be securely mounted to a flat horizontal surface or to additional NuGuard Racks when stacked with included anchoring hardware. To prevent unauthorized tablet use or theft, an optional stainless steel security bar and boron-carbide four-dial combination/keyed padlock are available. The NuGuard Universal Tablet Rack, priced at $349.99 MSRP, offers up to a 75 percent lower cost than other universal tablet storage products. The NuGuard Rack is immediately available from Newer Technology's exclusive distributor, Other World Computing (OWC®) at the special introductory price of $299.99; as well as through select retailers. 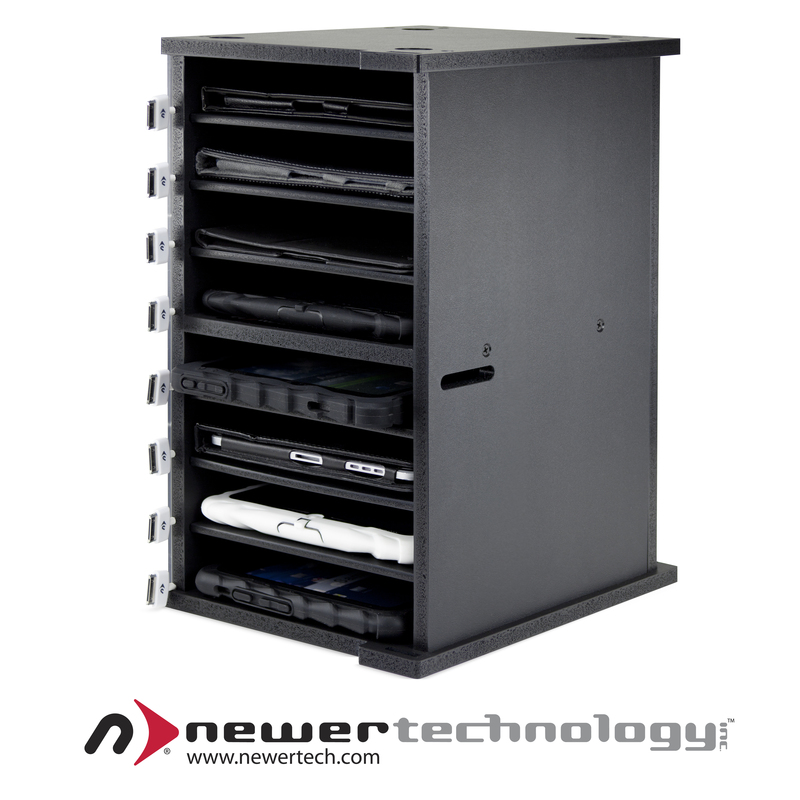 For more information on the NuGuard Universal Tablet Rack, as well as Newer Technology's complete line of accessories and upgrades for Macs, PCs, and iOS devices, visit: http://www.newertech.com. "A similar predecessor product, the GripStand Station, has been a big hit in education, business, and medical settings which use iPad tablets exclusively," said Grant Dahlke, Brand Manager, Newer Technology, Inc. "By offering this universal compatibility model, multiple brand tablet user environments can also enjoy the protective benefits, user conveniences, and purchase value this desktop rack design offers." Designed specifically for use with NuGuard GripStand® protective iPad cases, the Newer Technology GripStand Station allows iPad/iPad 2 & 3 tablets to slide easily and securely into one of eight bays to store, charge and sync. GripStand and NuGuard are registered trademarks of Newer Technology, Inc., registered in U.S. Patent and Trademark Office. Apple, Macintosh, Smart Cover, iPod, iPhone, and iPad are trademarks of Apple Inc., registered in the U.S. and other countries.